I am going to try and review a movie that I just watched, which I found to be amazing. 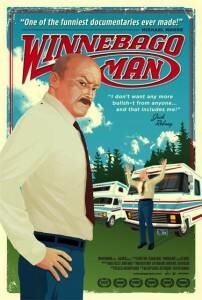 The name of this movie is �Winnebago Man�. With the advent of the Internet, all those crazy VHS tape clips have now been pulled out of the closet and put out there for all the world to see. And none are as more amazing as the ranting of the man labeled as �The Angriest Man on Earth�. A documentary filmmaker named Ben Steinbauer, decided to see if he could find, and document this legendary man, the internet Winnebago Man, by the name of Jack Rebney. The great part about this documentary is watching the director trying to figure out what he is actually searching for, what is his documentary about, and what will be the outcome at the end. The other part is the legendary angry man is Jack Rebney himself, this man does not mince words. I am not one of those reviewers to tell anything about the story, or the �trials and tribulations� of the road that are traveled. I will not tell what the outcome is, nor give away any spoilers. All that I can say is, this is a film YOU MUST SEE and is HIGHLY RECOMMEND. If you get a chance to rent the actual DVD be sure to watch the extras this adds a great deal to the film and should not be missed.